Ticket machines are available at the ground-level station concourse. First time riders must purchase a reusable BART ticket or Clipper card from a vending machine before boarding. All riders must pass through the faregates with a valid ticket or card. Keep the ticket or card for the ride and use it to pass through the faregates again when exiting the station. This station features side platforms. See sign for destination before heading to the platform. When transferring from BART, you can get a free BART to bus transfer before leaving the paid area. The transfer provides discounted one way fares on AC Transit. Lines 1, 1R and 801 stop on International & 34th Ave. All others stop at the bus plaza. To pay the daily parking fee, remember your space number, enter through the faregates into the paid area and pay at an add fare machine. Parking gets full at the station by 7am. 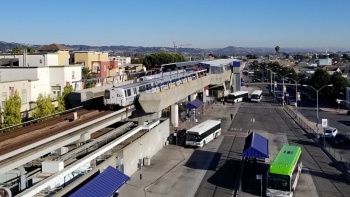 Paid private commuter parking is also available next to the Fruitvale Village between 35th and 37th avenues. A staffed bike station is available at the Fruitvale Village. It is operated by Bike Hub. This page was last edited on 17 October 2018, at 12:55.